Blu-ray Combo Packs and 2-disc DVD Special Edition include hours of new bonus features! Burbank, CA, January 17, 2014 – Experience space like never before in the Academy Award®-nominated “Gravity,” arriving onto Blu-ray 3D Combo Pack, Blu-ray Combo Pack, DVD and Digital HD on February 25 from Warner Bros. Home Entertainment. A heart-pounding thriller starring Academy Award winners Sandra Bullock (“The Blind Side”) and George Clooney (“Syriana”), and stunningly directed by Academy Award-nominee Alfonso Cuarón, “Gravity” pulls you into the infinite and unforgiving realm of deep space. “Gravity” was written by Alfonso Cuarón and Jonás Cuarón and produced by Alfonso Cuarón and David Heyman (the “Harry Potter” films), with Chris deFaria, Nikki Penny and Stephen Jones serving as executive producers. 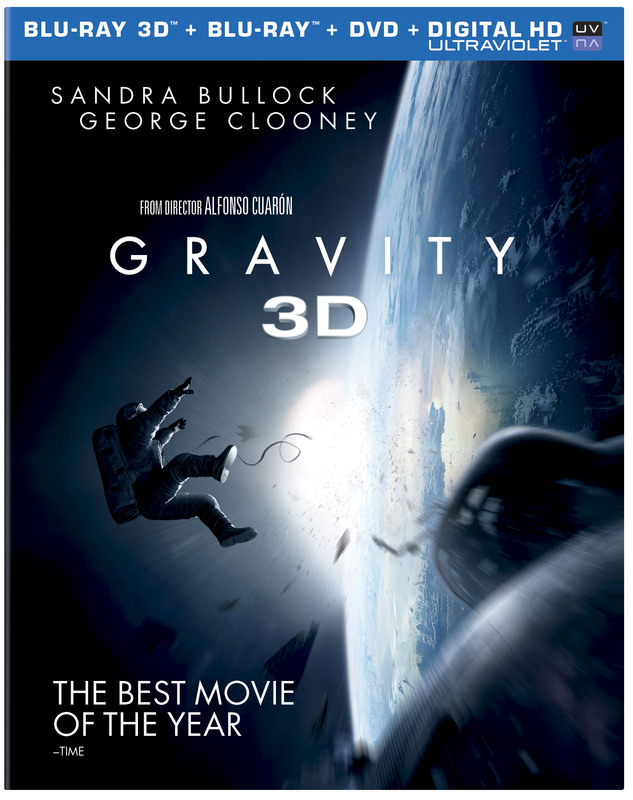 “Gravity” will be available on Blu-ray 3D Combo Pack for $44.95 and on Blu-ray Combo Pack for $35.99. Both include a digital version of the movie on Digital HD with UltraViolet. * Fans can also own “Gravity” in Digital HD on February 25 via purchase from digital retailers. “Gravity” has become one of the most honored films of the year, garnering 10 Academy Award nominations**, including Best Motion Picture of the Year, Performance by an Actress in a Leading Role – Sandra Bullock, and Achievement in Directing – Alfonso Cuarón. The film has also received 11 BAFTA Award nominations and 10 Critics’ Choice Award nominations, both including Best Picture, Best Director and Best Actress (Bullock)**. Cuarón recently received a Golden Globe Award for Best Director. “Gravity” has also won Best Picture awards from several prestigious critics organizations, including the Los Angeles Film Critics Association, and has been included on 395 critics’ and critics groups’ top ten lists, as well as being named one of the AFI’s ten best films of the year. It was also announced as the year’s best reviewed film by the website Rotten Tomatoes. Dr. Ryan Stone (Bullock) is a brilliant medical engineer on her first shuttle mission, with veteran astronaut Matt Kowalski (Clooney) in command. But on a seemingly routine mission, disaster strikes. The shuttle is destroyed, leaving Stone and Kowalski completely alone—tethered to nothing but each other and spiraling out into the darkness. The deafening silence tells them they have lost any link to Earth…and any chance for rescue. As fear turns to panic, every gulp of air eats away at what little oxygen is left. “Gravity” will be available for streaming and download to watch anywhere in high definition and standard definition on their favorite devices from select digital retailers including Amazon, CinemaNow, Flixster, iTunes, PlayStation, Target Ticket, Vudu, Xbox and others. Starting February 25, “Gravity” will also be available digitally on Video On Demand services from cable and satellite providers, and on select gaming consoles.